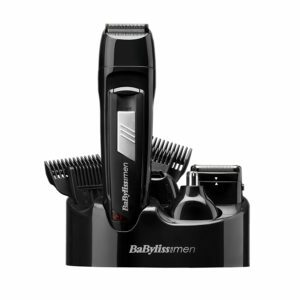 If you are looking for a one-stop solution for all your trimming and grooming for your facial and body hair, the Babyliss 7056CU Cordless Rechargeable 8 in 1 all over grooming kit is the right choice for you. It comes with various types of combs and trimmers so that you can achieve the style that you wanted. This is one of the most professional trimmers available in the market as it does its job with a great degree of quality by providing comfort/safety to the users at the same time. Take a look at the features, pros and cons of this trimming kit to understand more about this product and to know how it provides good value for your money. Yes, the Babyliss 7056CU is not a perfect trimmer that you would find in the market. However, we must admit that it provides more services than what we pay for. At such an affordable price range, this trimmer comes with various features that help us try different hair styles daily. It is great for smooth lines, removing unwanted hair for achieving fine detailing to a considerable extent. Hence, it is worth trying out this product, if you want a professional grooming experience at an affordable price. It has 3.9 out of 5 stars currently with a large amount of reviews, and about 70% 4 stars or higher. The variantions in reviews are people who really believe this product was very bad or perfect for them. If you are looking to need a trimmer you use daily, you are going to want to buy a more robust trimmer. Look through our other reviews for a higher level quality product like the Wahl 9916-1117 Groomsman Review. There are a multitude of questions answered if you still are looking for more information on the Babyliss 7056CU, just follow the link.